Hey we're paddlers, not scientists! Scott and I always tell people that we are paddlers not fisherman when they ask how the fishing is. Same thing could be said when it comes to sciencey type things. It's a good thing we surround ourselves with smart people. On our trip we will be monitoring some basic water quality standards. Total Dissolved Solids, Secchi Disk Readings, and Transparency Tube Readings. Total Dissolved Solids (often abbreviated TDS) is a measure of the combined content of all inorganic and organic substances contained in a liquid in: molecular, ionized or micro-granular (colloidal sol) suspended form. Generally the operational definition is that the solids must be small enough to survive filtration through a sieve the size of two micrometer. Total dissolved solids are normally discussed only for freshwater systems, as salinity comprises some of the ions constituting the definition of TDS. The principal application of TDS is in the study of water quality for streams, rivers and lakes, although TDS is not generally considered a primary pollutant (e.g. it is not deemed to be associated with health effects) it is used as an indication of aesthetic characteristics of drinking water and as an aggregate indicator of the presence of a broad array of chemical contaminants. Professor Chuck Rose from St. Cloud State University will be analyzing our data and telling us what it means. The Secchi disk, created in 1865 by Pietro Angelo Secchi SJ, is a circular disk used to measure water transparency in oceans and lakes. 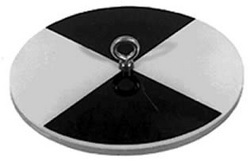 The disc is mounted on a pole or line, and lowered slowly down in the water. The depth at which the pattern on the disk is no longer visible is taken as a measure of the transparency of the water. This measure is known as the Secchi depth and is related to water turbidity. The Sauk River Watershed District will compile our data. The Transparency Turbidity Tube is used to estimate stream quality as it relates to suspended materials in water, measuring water clarity. Just as a secchi disk is used as a measure of lake quality, the transparency tube is an excellent reference for the study of water quality. The 1 3/4" diameter clear PVC tube is marked in cm from 0 to 60 with a 4.5 cm standard secchi disc pattern at the bottom of the tube. To use, the tube is filled with water and drained off using the drain tube until the secchi pattern appears. The height of the water column is then recorded. Each reading becomes a reference for measuring changes.